Hayden Proud makes the point that Pemba’s aesthetic sensibility remained rooted in late nineteenth-century French modernism, thus excluding him from the mainstream twentieth-century version. Proud recounts that late in life, Pemba desired to visit Paris in homage of the artistic authority of the city in his sensibility, motivated perhaps by a haunting regret that for reasons both personal and political, he did not follow his contemporaries Sekoto and Mancoba into exile. Stylistically, it would be an over-simplification to categorize Pemba merely as a self-taught artist working in relative isolation with a dominating singular influence. Pemba’s artistic development has had a multi faceted history, interwoven with his shifting aesthetic persuasions, and influenced by a Christian education and upbringing, in a household which had absorbed the paternalistic English authoritarian principles of Victorian colonialism. His ideological progression to African nationalism and the re-discovery of his repressed Xhosa culture, added another dimension to his extensive oeuvre which has been collectively described as one of historical and social commentary. The artist therefore worked mostly outside the realms of the formal South African art establishment, without its characteristic critical considerations, for more than 60 years. George Milwa Mnyaluza Pemba was born in 1912 and was educated at a mission school near Port Elizabeth. He enrolled at the Lovedale Teacher Training College at Alice in the Eastern Cape, and like his contemporaries Mancoba and Sekoto, qualified as a teacher in 1934. In 1935 Pemba found a teaching post at a school in King William’s Town. He was supplementing his income with painting commissions in an effort to help support his mother and large extended family who had been under enormous financial strain since his father’s death in 1928. 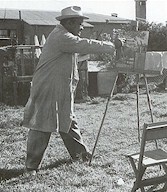 In 1931, during his studies at Lovedale, Pemba received his first formal art training in painting and drawing from Ethel Smythe who taught art at the University College of Fort Hare, and introduced him to the ‘laws’ of watercolour painting – how to mix colours and apply specialised wash techniques. Aside from the costs barring his studies, the exclusion of blacks from white education institutions limited possibilities. However, in 1937 the Bantu Welfare Trust provided Pemba with GBP60 to study as an ‘external’ student for four months with Prof. Austin Winter Moore, Head of the Art School at Rhodes University in Grahamstown, who continued his focus on watercolours. Pemba subsequently entered the May Esther Bedford Art Competition of that year, resulting in him taking first prize with Gerard Sekoto the runner-up. In 1938 he resigned as teacher and moved to a better paid job at the New Brighton Department of Native Administration in Port Elizabeth. His second marriage to Nombeko Eunice Mndi in 1939 was an enduring partnership - they were married for 47 years and had five children. In 1942 he visited Cape Town where he met Gerard Sekoto who advised him to switch to oil painting, because they were more saleable, and to broaden his subject matter from portraits to scenes describing township life. Pemba later met Mohl in Johannesburg who affirmed Sekoto’s advice, and encouraged him to paint full time. Like Sekoto, Pemba longed to travel and work in Europe in order to broaden his horizons and gain experience, but his financial responsibilities made this impossible. In 1944 he secured a further grant from the Bantu Welfare Trust which he used to embark on a grand tour of South Africa to see and experience the different peoples in their natural surroundings. He travelled to Johannesburg, Durban, rural Natal, Basutoland and Umtata – expressing particular interest in the indigenous cultures and tribal life of the different regions. He made numerous sketches which he later used to produce watercolours depicting the different rural peoples in their tribal dress. In 1948 he had a successful solo exhibition in Port Elizabeth and resolved to devote all his efforts to painting. Unfortunately, he struggled to support his family as a professional artist and had to supplement his income. He decided to start his own business and opened a small general dealer’s store which he and his wife ran until 1978. During the fifties, the effects of apartheid on South African society were becoming evident. Pemba was enraged by the injustices and expressed his hatred of the apartheid system by depicting the struggle of black peoples’ everyday lives in his paintings and showing its impoverishing effects. For much of the sixties Pemba and his wife also assumed financial responsibility for his brother’s family as well as the children of relatives – maintaining a total of 20 children. He received some relief from an unexpected source when the IDAF, a London based organisation providing clandestine support for victims of apartheid, regularly started sending him some money from 1968 until 1990. As a result of the politics of the time and his family commitments, Pemba’s career did not progress as well as he had hoped in the fifties and sixties. The financial pressures of supporting an extended family as well as running a business were also compounded by his battle with alcohol. His drinking problem had started in 1944 and by the early 1970’s it was affecting both his health and his work. After many failed attempts he eventually managed to stop drinking, and started to paint consistently. In 1979 Pemba was awarded an honorary Master of Arts degree by the University of Fort Hare. He had handed over the running of his store to his family and was painting full-time. He began to portray the Xhosa people practicing their traditional customs in an urban rather than rural setting. By the end of the eighties he had become one of South Africa’s most revered black artists, finally receiving recognition for his contribution to South African art. Commercial success followed, culminating in two very successful exhibitions at the Everard Read Gallery in Johannesburg in 1991 and 1992. In 1996 he was the subject of a large touring retrospective exhibition organised by the South African National Gallery, with a catalogue edited by Hayden Proud and Barry Feinberg. The same year saw the publication of a monograph on the artist by Sarah Hudleston, ‘George Pemba:Against All Odds’. Despite years of adversity and poverty, George Pemba’s painting career spanned six decades - providing a visual history of what he had witnessed in a transforming South Africa. Working mostly in isolation, he had established himself as a pioneer of social realism, taking his inspiration from the realities and struggles of urban black people’s everyday lives in a troubled South Africa. As Proud concludes in his obituary, ‘Pemba was an artist in love with painting, unashamedly claiming the best of both European and African traditions as his own. Possessed of a deep humility, a profound sense of human dignity, and a loving sense of humor, his memory deserves a special place in the nation’s heart’. Proud, Hayden & Feinberg, Barry (Ed.). George Milwa Mnyaluza Pemba: Retrospective Exhibition Catalogue. Cape Town: SA National Gallery, 1996. Hudleston, Satah, George Pemba – Against All Odds, Johannesburg, 1996.